Indian women are known for their love for accessories. 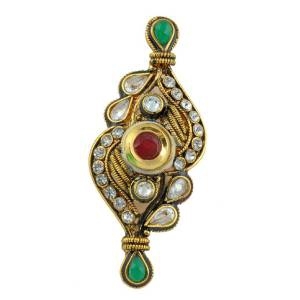 Indians are one of the people that know the value and beauty of jewellery on a woman. That is why their women are always adorned with some of the most beautiful jewellery. Craftsvilla likes to keep this tradition of self-adorning alive for Indian women but keep the evolution going so that they keep getting better every day. One of the pieces of jewellery that you will never miss on an Indian woman is the Ring. 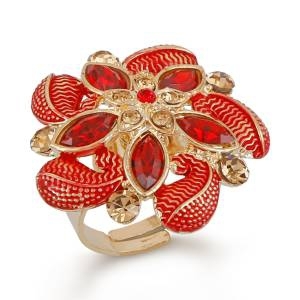 Craftsvilla, therefore, tries to keep the supply of the best ring designs flowing to satisfy the need of every woman. 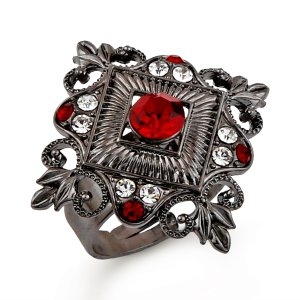 We have some of the most beautifully and creatively crafted finger rings that will blow your mind. Our team of professionals always goes the extra mile to ensure they use the best, high quality and luxurious materials so that it can speak of your elegance, style, sophistication, elegance, and class. You can find our rings online with a lot of ease, and you can purchase any piece that suits your preference. You will not be disappointed. Rings are a type of jewellery, and it is a round band that is worn on the finger and sometimes on the toes. But if we are strict with the term, it would apply to bands worn around the finger. The history of rings can date back to 2500BC whereby rings were found in tombs in UR. People in the Old Kingdom of Egypt also had their variety of rings. In the Egyptian Middle Kingdom, rings became more popular, and they were made from metals and had complex designs. During the Ptolemaic Dynasty, the Greek and Roman fashions superseded the native styles and became dominant. In the third and fourth centuries AD, the Roman Rings became the popular rings. In Europe, during the High and late middle ages, fashion took a turn, and people started wearing multiple rings on their hands. The rings were made of alloys, gold, or silver. The use of gems was also introduced in the designing of rings. The rings were engraved to give them more meaning. From the 13th century moving forwards, the world saw numerous trends for ring designs emerging as many countries picked up the trade. As old as India can be said to as old as when the practice of making rings started. Since the start, we have seen a lot of evolution taking place up to where we are now. To come up with a beautiful finger ring, Craftsvilla considers every piece of information that is of value from the past to the present to inspire us. This also helps us stick with the culture as we try to take the art to a new level in a modern world. Craftsvilla offers some of the most exquisite finger rings whether engagement rings or for casual wears. These rings are made keeping in mind Indian womens clothing. She is a woman who is proud of her tradition and yet not scared to try something new. That is why we blend modernity with tradition to bring you perfectly balanced and blended ring designs. To pick the perfect ring, consider the following. Color: we have numerous colors that you can choose from our line of rings for girls. We have colors such as pink, purple, red, black, brown, blue, orange, and so on. You can choose accordingly. The material used: we use materials such as bronze, brass, acrylic, alloy metal, and so on. You can pick according to your desire. The style of the ring: we have different styles of finger rings at Craftsvilla. They include modern, contemporary, tribal, vintage, formal, Bohemian, and so on. Whatever your style is, we have got you covered, and you will be satisfied. The stone: our rings use different stones, and the most dominant is the American Diamond. They give the perfect shine and glow that a ring, especially an engagement ring deserves. The design and the set type: we have some of the most amazing ring designs at Craftsvilla. 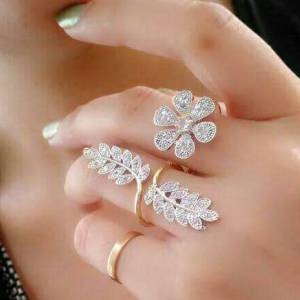 During your rings online shopping with Craftsvilla, you will get cocktail rings, multi-finger rings, solitaire rings, bands, and so on. You will also get three set types. They are single rings, a pair of rings, or a combo. The size of the ring: our rings for girls come in different sizes, and everyone’s finger size varies. That is why we have our smallest finger size being 6.0 and the largest being 30.0. Other than these, we have those rings with adjustable sizes to fit anyone. The plating: this is the finishing of the ring and the finishes that we have to include gold, silver, platinum, copper, steel, zinc, rose gold, and so on. They are all beautifully done and will be perfect for you. Whatever you want we have it. The purpose: rings are worn for different reasons. Some are worn to show one is married, some are for engagement, and others are for casual wear. Therefore, the purpose of the ring can guide your choice as well. 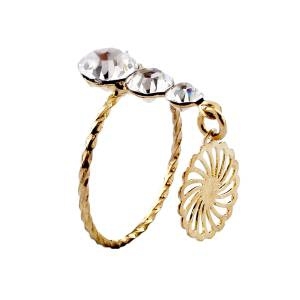 When you want a finger ring, Craftsvilla is the perfect place to start your search. And once you start, you will not go to any other place because you will find what you are looking for. 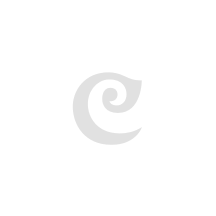 Craftsvilla is a place that takes cares of the need of every woman. We are diverse, and we strive to give every woman what she wants. Whether you want a traditional, modern, vintage, contemporary, or tribal ring, we have got you covered. We also have all kind of plating to meet diverse needs of your style, be it Saree, Lehenga or Salwar Suits. Every of our ring designs is unique, elegant, and sophisticated. All the finer details are taken care of to ensure that you get what your money is worth. We have simple and complex designs that will speak well of your sense of fashion. Whether you want a perfect blend of tradition and contemporary, we have you covered. We also have colorful rings that resonate well with Indian women. 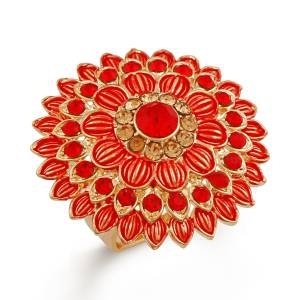 Craftsvilla has the best rings online that meet your standards. Every time you want to do rings online shopping with Craftsvilla, you will be impressed what you will find because we like to bring in new rings into the business to keep things fresh. Also, with Craftsvilla, you will not experience any hurdles while shopping because everything is designed to meet your ease of operational needs. That is why shopping with Craftsvilla is the most fun experience. It is a pleasure!